*New Career Opportunities at RE&LS! Click Here To View. Over the past two decades, Ravi Engineering & Land Surveying, P.C. (RE&LS) has demonstrated excellence in structural engineering, environmental engineering, land surveying, transportation engineering, construction inspection and allied services. RE&LS is an MBE certified consulting firm with offices in Rochester, Binghamton, Albany and Buffalo, New York, and Allentown, Pennsylvania, specializing in providing state-of-the-art structural, transportation, environmental and geotechnical engineering services, as well as construction inspection and land surveying services to architects, engineers, owners, developers, contractors and government agencies. Check out our Careers page for other employment opportunities! RE&LS staff attended the implosion of the Route 219 Bridge over the Zoar Valley Gorge. The implosion was needed to begin construction of a new modern bridge. RE&LS is the prime consultant for construction inspection on this project. 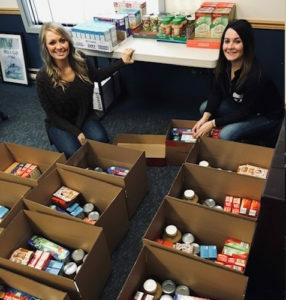 Our team donated and packed 30 boxes for the Thanksgiving appeal! The Thanksgiving appeal is a program that provides Families in Rochester with Meals for Thanksgiving. 30 boxes will feed 300 people within the Rochester Community. Great Work everyone!! RE&LS employees received Safety & Operational training this month from our own Alex Kaplun. Alex is an authorized trainer for the OSHA 10 and 30 -hour safety course training. 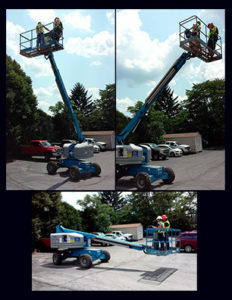 RE&LS has provided the training in Aerial Lifts in accordance with 29 CFR 1926.453. Training provided the Understanding of Lift Safety Features, Ability to Evaluate/Identify Potential Safety Hazards and the Proficiency In Aerial Lift Operation.